We feel like the luckiest people on earth. We get up each morning eager to work our passion and we get to enhance the quality of living for our clients by redesigning and creating spaces they could only dream of. Not only that, we are hugely blessed to meet so many FUN clients whom are so unique, trusting and so open with us. They are as beautiful as the spaces we create. 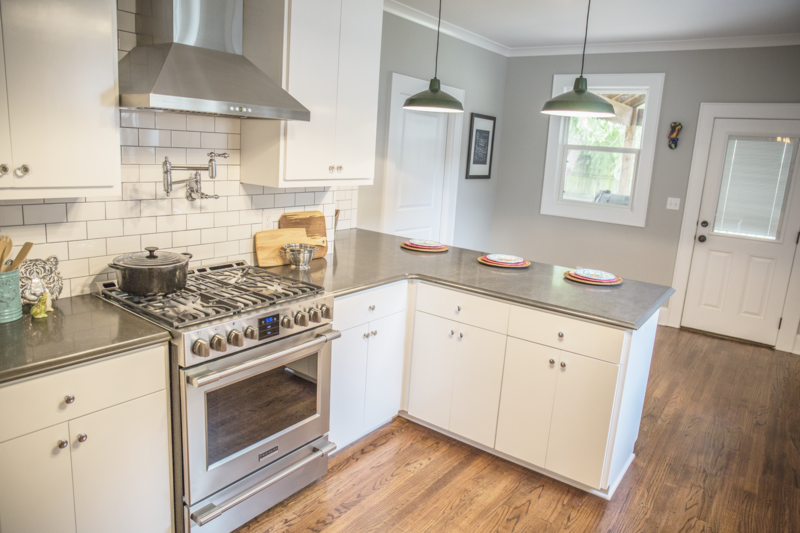 This particular kitchen remodel story begins in the sweet little neighborhood of Broadmoor in Shreveport, Louisiana. These homes are rich in history and many still hold the design elements used back in the early 1900’s when the area was being developed. 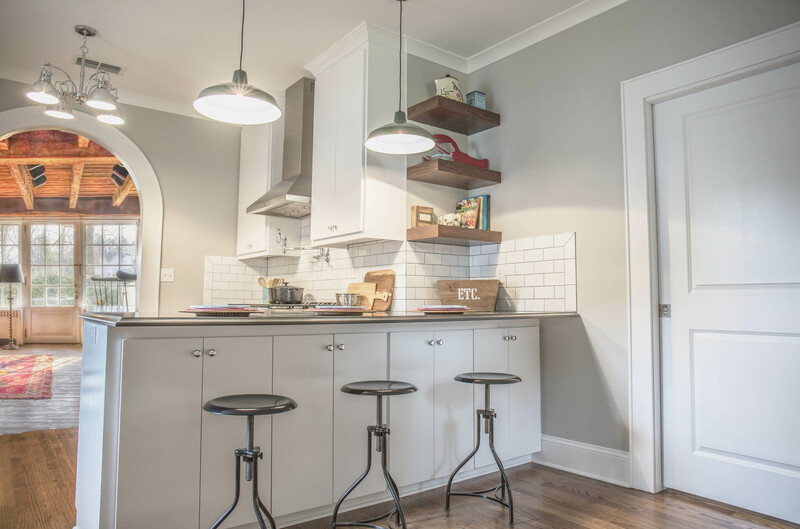 What is so special about this particular cottage home is not just the vintage design features we found on demo day (knob and tube and of course – shiplap) but that our clients planned and saved for the kitchen of their dreams for 4 years. 4 YEARS! And we, Ashley’s Building, were honored to be selected to tackle the job of bringing their 50+ year old home into the new millennium while paying homage to it’s past. Many times our clients have an idea of colors and somewhat the style they want, but give us the reins to redesign a project for them based on our conversations and family dynamics. 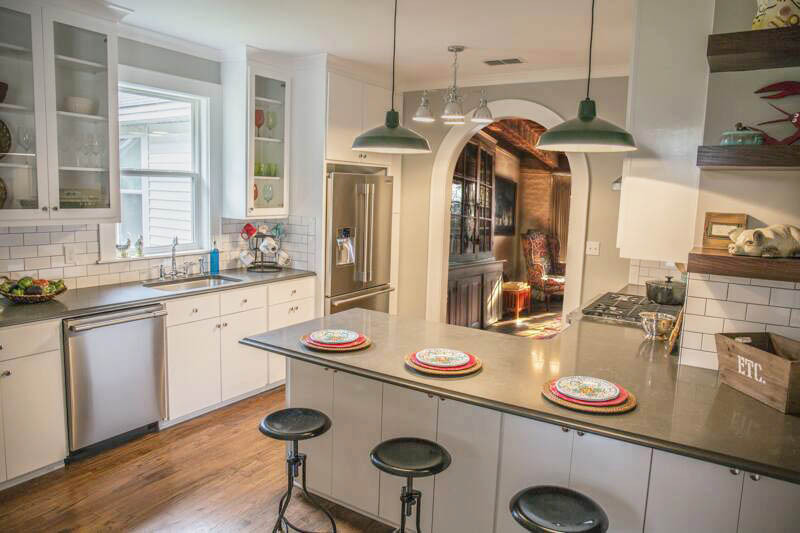 In this kitchen remodel, the lady of the house had been collecting magazine clippings that she had saved over the years and had a very clear vision of what type of style kitchen she wanted. She knew every detail from the appliances to the glass cabinet knobs and color scheme which made that part of my job very easy. 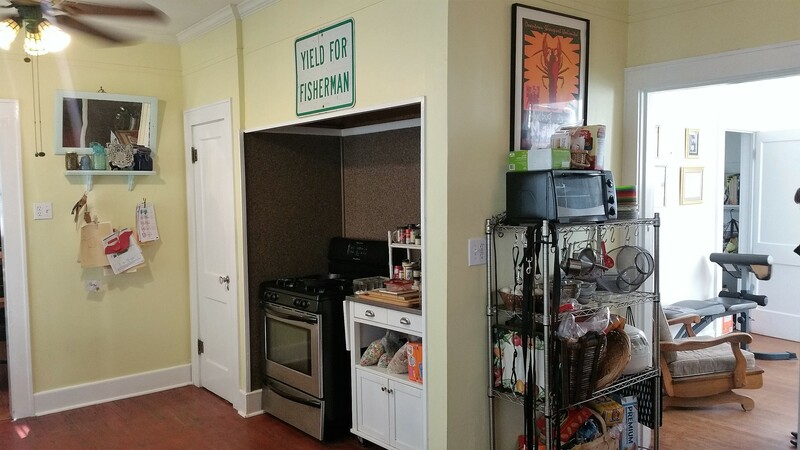 Plenty of counterspace, pantry and more storage. Designated cooking area with plenty of prep space. 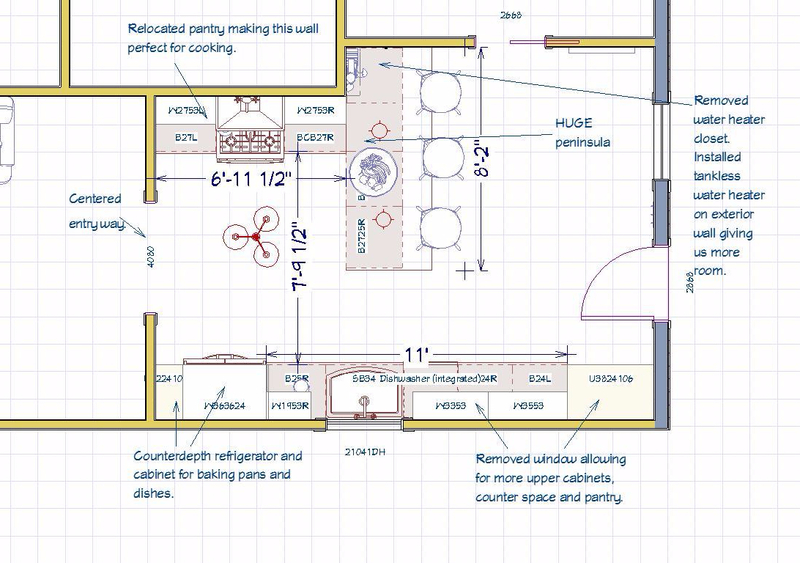 The hard part was redesigning this odd kitchen and using every bit of space properly that would give them a spacious working triangle and everything they desired. If only we could remove that little closet near the office door. Hmmmm. The closet actually housed the water heater that was on it’s last leg and no longer up to the latest building codes, so relocating was great… giving the client a tankless heater.. even better. Our clients loved the spacious new design we created and were eager for demo day! 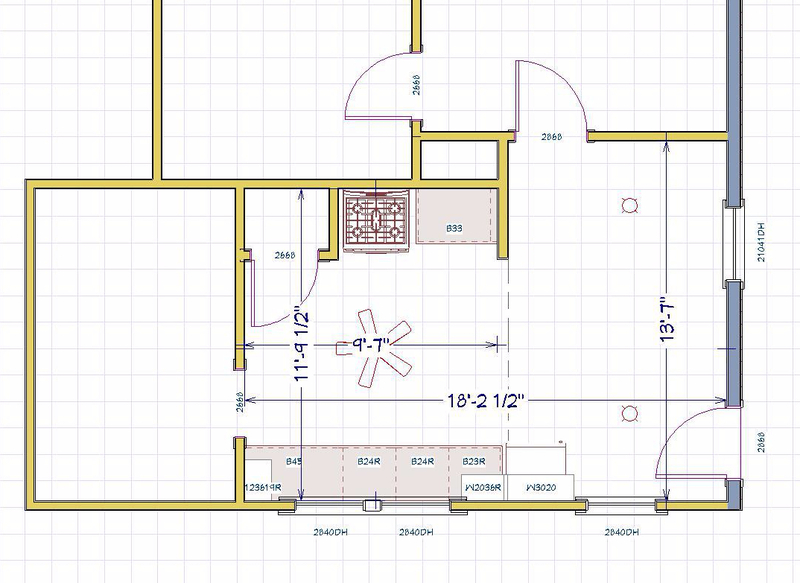 With the floorplan approved, I presented them with their 3D renderings and it was LOVE. I used many of the design elements our client has been saving over the years so they could see what it would all look like put together in one room. The finished results were almost identical to their designs. Take a look! Oven is in a cave and not at all comfortable for cooking and the water heater closet has GOT to go! With the cave gone and heater closet removed client has enough room for this 8 foot peninsula. They can easily fit more stools there as you can see. Our homeowners didn’t need all three windows and didn’t like where the refrigerator was located. 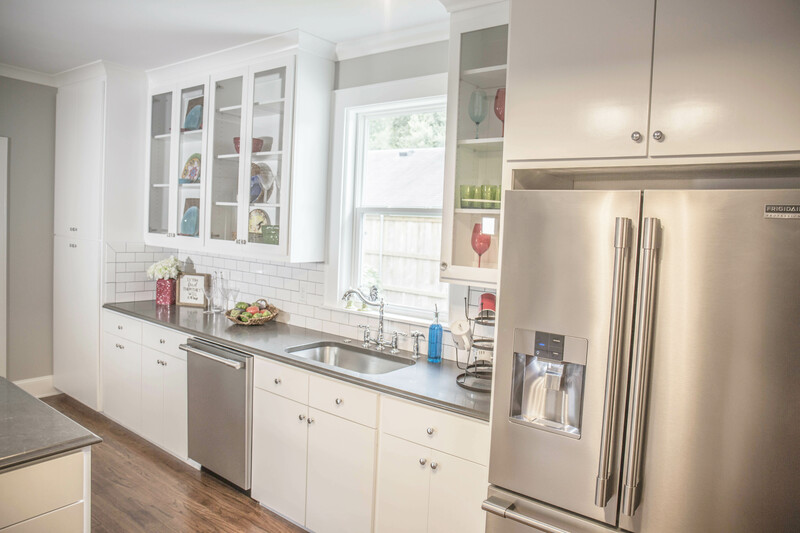 Because the client wanted a farmhouse style kitchen, but with clean modern lines, she opted for flat paneled cabinet fronts but with framed upper glass cabinets on the sink wall to showcase her collection of fiestaware and other dishes that have been passed down to her by her mother. 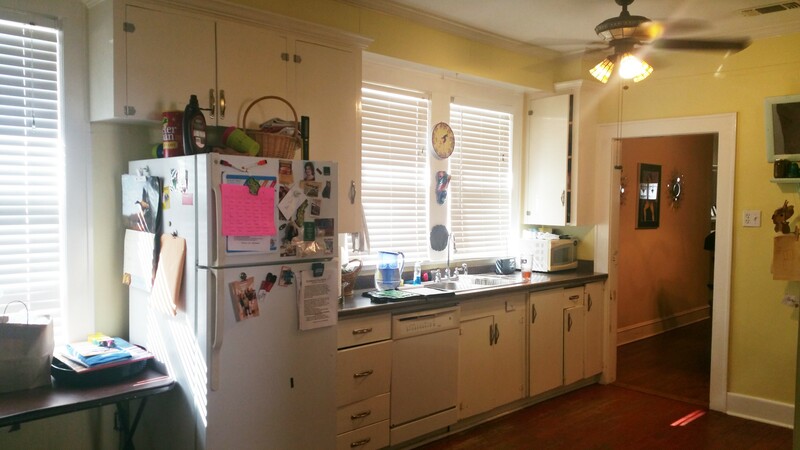 The lower cabinets had pull out drawers for easy to find pots and pans storage, as did the large pantry and we added a baking dish and tray cabinet to the right of the refrigerator with adjustable shelving. 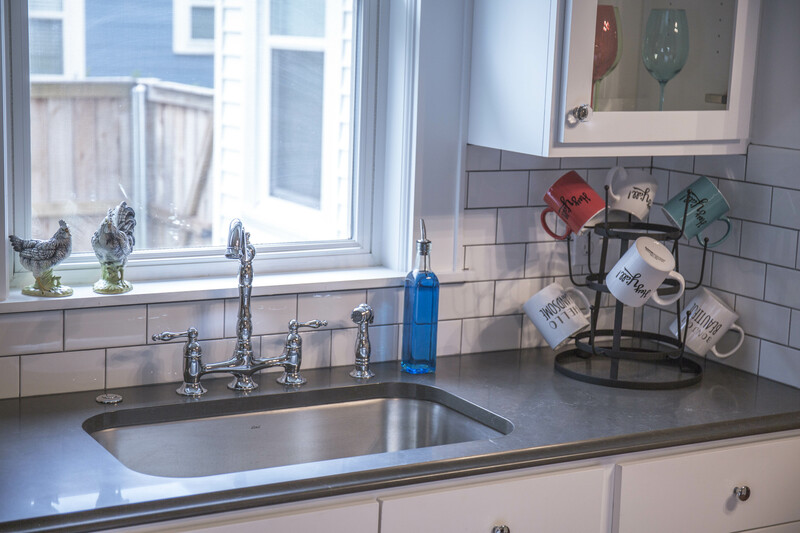 We even made sure the subway tile backsplash grout lines were thicker and stood out to compliment the dark grey Piatra quartz countertops. Being that she and her husband love to entertain and their home is the house on the block that all the kids go to play with their young son, they are often found feeding many hungry little mouths, so a hardworking stove was on the menu near their peninsula bar. Being that the front entry of this home was arched brick, the lady of the house wanted a framed arch entry into the kitchen. We had the original red painted wood floors sanded and refinished which came out AAHHH-Mazing! The finished results were beautiful and exactly what our clients had planned, saved, and hoped for. Photo credit: Black Helmet Films, LLC. Home Staging Decor: Pier 1 of Shreveport, Kirklands of Shreveport, The Antique Market Place.